Choose your rehair date below. The date you choose will be the day your bow is photographed, cleaned, polished, rehaired, and shipped back to you. We prefer to not ship on days that would result in bows spending the weekend in a shipping facility; specifically Fridays, or Thursdays for clients a greater distance from the workshop. This calendar is also an up-to-date reflection of “in store” rehair appointments. If you do not already have a NetRehair Tube, please order one before scheduling your “send in” rehair. Tube orders are processed and shipped within one business day. Provide the brand on the handle of your bow(s) if applicable. If your bow needs repair or if you have concerns regarding it’s health, please let us know in the “Details” section of the form below. Each bow is examined as soon as it arrives at our workshop. We will email you an estimate for the repair(s) that includes the cost and an estimated date of completion for repairs. As of January 2015 we are offering a faux ivory option for replacement tips. Otherwise tips are replaced with extinct Mastodon ivory; please email us for more details. We are usually booked for major bow restorations and replica frogs several months in advance; please email us if you would like to discuss this sort of restoration and/or get on our waiting list. For more information about our repair and restoration techniques you may visit http://www.trianglestrings.com/techniques/. UPS is our primary shipping provider however we are happy to accommodate wishes for USPS and FedEx shipping. UPS ground to most cities within NC, SC, VA, and TN are 1 day transit times. Send us an email if you have any questions about transit time to your area. By default, we require that someone signs for the bow upon its return to you. If you DO NOT wish that we require a signature please let us know in the “details” section below. You may also choose “Pick Up In Store” for an in house appointment. Depending on the rehair date you have chosen, you may wish to either wait to ship your bow(s) or go ahead and ship it as soon as you have scheduled an appointment. Please have your bow(s) at our workshop the day before your scheduled rehair date; of course sooner is also okay. Use the packing instructions on the inside of your NetRehair tube, or follow the visual directions here on our website to pack your bow(s) safely inside your NetRehair shipping tube. Take your package to a local shipping store or postal office. Ship to: 4911 Waters Edge Dr. Suite 200, Raleigh, NC 27606. ***If you have chosen “Pick Up In Store” you may choose to drop off or ship your bow(s). Either method, we request that your bow(s) is at our workshop the day before your appointment. 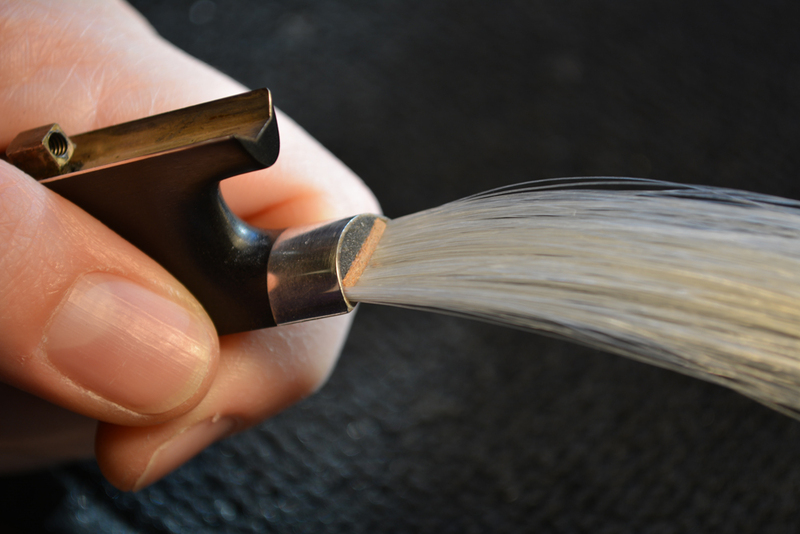 The cost of a rehair is $75 for violin, viola, and cello bows. For bass bows we offer white hair, salt and pepper, or black hair at $87, $82 and $75, respectively. If you would like black or salt & pepper hair please tell us in the section below titled “details”. Payment is requested via email once your bow arrives at the workshop and has been examined. We accept all major credit cards. ***If you have chosen “Pick Up In Store” you may pay when you pick up your bow(s). Green dates have appointments available. Red dates are booked.